Los Angeles County Sheriff, Lee Baca is known for working with the ethnic communities to protect the rights of Muslims, Hindus, Sikhs, Catholics, Jews, Christians, Buddhists, and other religions or faith based organizations throughout the County of Los Angeles. After travels throughout the world, I have seen the constant, ubiquitous public desire to receive respect and quality service from the police. Police cultures, however, tend to appear closed and somewhat authoritarian oriented. Equal protection of religious rights is supreme in the United States and that it is crucial to ensure that all faiths are equally protected. This country has avowed desire to the point of law, since its founding, that all religions will be protected equally. Our nation cannot afford to have elected leaders who condemn a religion without knowing even what the religion’s tenets are. People who refuse to protect a religion should not hold a public office. Our Public Trust Policing is the use of police resources in a manner that includes the public’s participation in the mission of public safety. Our law enforcement to recognize that without the full faith and cooperation of the public, the mission of public safety is severely impaired. Public Trust Policing includes public participation, Community Law Enforcement Partnership Program, Community Academies, Community Advisory Committees, Ethnic Advisory Councils and Interfaith Advisory Council. Community Advisory Committees or these councils act as liaisons between sheriff’s stations and the communities they serve, consisting of members selected to best represent the diversity of the area. They provide direct input from the public regarding local issues and assist in the development of programs suited to their communities. 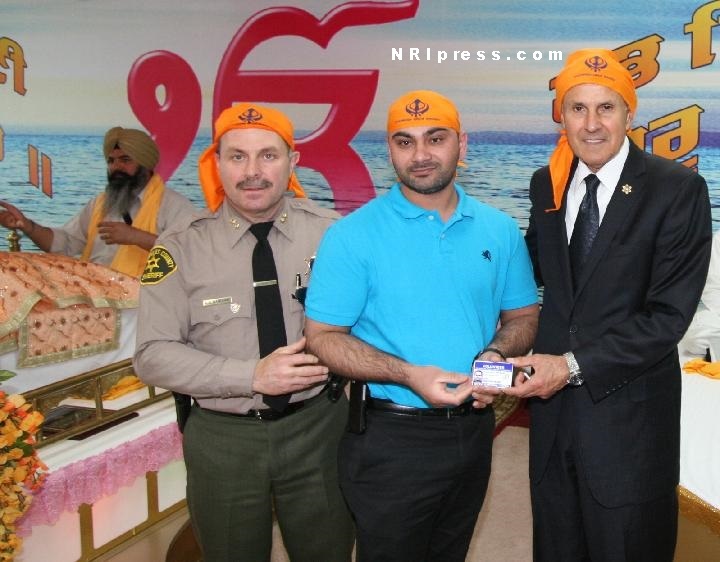 ·Sikh community leaders, willing to facilitate the Sheriff's Department into their community were issued Sheriff ID Cards by Lee Baca. Atwal Mahabir, Bassi Narinder, Bassi Rajvinder, Bhasin Gurbax, Bhullar Kamalpreet, Bhullar Devinderpal, Bhullar Nachhatar, Dhillon Ravinder, Gill Sohan, Juneja Gurbachan, Nijjar Paramjit Singh, Hanwant Singh, Jaspreet Singh, Jagjit Singh, and Tarvinder Singh. To build the Trust between the Sheriff's department and our own community. In case of emergency and disaster, we can help to communicate between our community and the Sheriff's department. Sheriff Baca commands the largest Sheriff’s Department in the United States with a budget of 2.4 billion dollars. He leads nearly 18,000 budgeted sworn and professional staff. Sheriff Baca earned his Doctorate of Public Administration Degree from the University of Southern California. California’s county of Los Angeles with over an annual budget of $2.40 billion, law enforcement services to 40 contract cities, 90 unincorporated communities, nine community colleges and 47 Superior Courts is the largest sheriff's department in the world. Los Angeles Sheriff's Department has taken great strides to truly connect with the residents of Los Angeles County and provide them with the tradition of service that they proudly proclaim. Sheriff’s Department of Los Angeles County was established in 1850. Since then, 25 men have served as sheriff, including Lee Baca, who marks a decade in office this year.